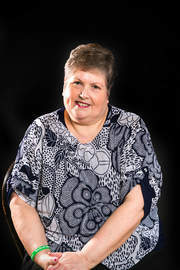 Hi I am Gaynor Leech and I started this website in September 2013 having lived with Secondary lymphoedema since May 2011. This website is for all of you who are living with the lifelong condition of lymphoedema. Please remember I am a patient, I learn as a patient, I read as a patient, I speak as a patient and write as a patient. All the material on these pages is set out in good faith. Thoughts and interpretations are mine. Every effort has been made to acknowledge sources throughout this site. When I first started this website there was a leaning towards secondary lymphoedema because I live with this. 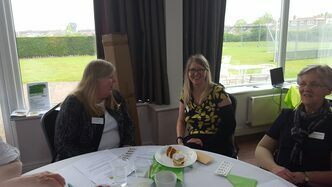 However, it soon became clear that those living with primary lymphoedema need as much support, if not more. Why do I say this? Because many of the secondary lymphoedema cases are a direct result of cancer treatment and either have access to NHS services or Hospice services. Although these services can also be patchy. The care and treatment for both primary and secondary lymphoedema follow the same principles. If you have primary or secondary lymphoedema the information on this website is relevant to both conditions. I was referred to the lymphoedema clinic at Mary Ann Evans Hospice. My first appointment was within 2 weeks. Initially I had MLD treatment every other day, then weekly and for the next 2 years my treatment was every 2 weeks. The lymphoedema clinic I go to is now running at capacity and my treatment has been moved to once a month. My nurse taught me how to do SLD. This I do every day after my shower, along with moisturizing which keeps my skin in good condition. There are areas I can't reach and lymph fluid builds up and feels sometimes as if I either have a golf or cricket ball under my arm. 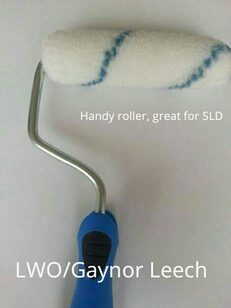 My trusty paint roller is a wonderful way of reaching parts I can't, or I can ask a family member to help with. The treatment I receive at the Hospice, my daily routine of SLD, moisturizing and Healthy Steps classes organised by the lymphoedema clinic at the Mary Ann Evans Hospice, keep it under control. If I didn't have all this help and support, I hate to think what state I would be in. Even with all the treatment I receive, I continually get, the constant dull ache that often turns to pain. Often debilitating. As far as I am aware there is no help for the psychological effects of lymphoedema. I have lived with lymphoedema since May 2011 and consider myself extremely lucky that even with the challenges my lymphoedema causes me, for the best part mine is managed and controlled. Has the anger subsided over the lack of support, education and ignorance re lymphoedema? Yes, I think it has, however, I have developed a passion to get the word out there and I do feel that, through L-W-O we are taking small, positive steps to help all who live with this condition. Since developing cancer and lymphoedema, I decided I needed to take more control of my life. I do my best to stay positive which sometimes is difficult with the daily challenges lymphoedema brings. Here are a few new rules I created for myself. ​Biggest learning curve. never judge the way someone looks, you do not know, what challenges they are facing with their health. Please remember that not all illnesses or disabilities are visible. I have a real bee in my bonnet about the initial lack of education, knowledge, promotion and ignorance of lymphoedema that I came across when I was first diagnosed. For me learning about lymphoedema has made it easier to deal with. I am absolutely gobsmacked at how little is known about lymphoedema and that certain areas in the UK have little or no support. In the beginning I was given information to read but my need to fully understand my condition led to lots of reading and research online, some of it good and some not so. I am member of the British Lymphology Society, a member of Lymphoedema Support Network, Affiliate of International Lymphoedema Framework and actively work across Coventry & Warwickshire and online to raise awareness of lymphoedema. This website provides information that promotes the well-being of lymphoedema patients, giving tips and advice. L-W-O recommends always that you contact your own health-care professional. Please read the medical disclaimer at the bottom of the page. In May 2014, I was asked by those who visited the community page to set up a Facebook Members Support Group, this is a closed group and therefore more secure than the community page. This allows our members to talk more openly about their condition. I did wonder whether it would be possible to run a support group online, however, the support group has over 950 members. We have some lovely positive support members. 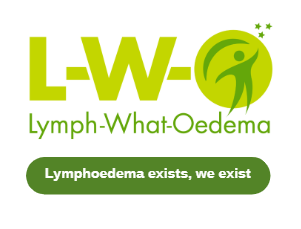 L-W-O continues to raise awareness of Lymphoedema. From September 2013 - January 2016 I funded the website, online support group and community page. This has cost me personally £750,00 per annum. The hours I have devoted to L-W-O are incalculable. 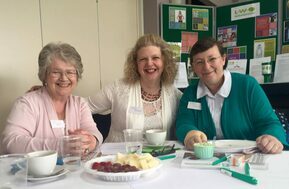 L-W-O is invited to several meetings and networking events that gives us an opportunity to work with other organisations who are interested in the raising awareness of lymphoedema. 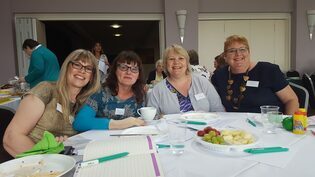 Pictured above a few of our lovely members enjoying our Lymphoedema Awareness Day in May 2016. Running L-W-O has led to many new opportunities and 2017 was a phenomenal year for us, being invited to many events in the communities of Bedworth, Coventry, Nuneaton and Birmingham. Our growth never cease to amaze me and I am humbled by the support that L-W-O continues to receive.